Global Fiberglass Duct Wrap Insulation Market size was worth more than USD 1.5 billion in 2017 and is anticipated to surpass 900 million square meters by 2024. 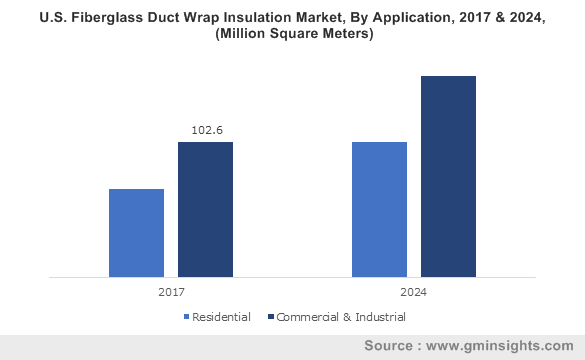 Shifting trend towards energy efficient solutions in construction applications along with robust growth in global construction industry are among the key factors driving the fiberglass duct wrap insulation market growth. Global construction output recorded USD 8.8 trillion in 2016 and is expected to surpass USD 10.1 trillion by 2021. Increasing adoption of air flow-based HVAC system in commercial as well as residential constructions will propel the industry growth. Increasing consumer awareness pertaining to energy conservation particularly in the North America and Europe will support the industry demand. Rapid industrialization coupled with growth in construction of educational, offices, healthcare and institutional buildings will drive the fiberglass duct wrap insulation market. Rising consumer focus to maintain ambient environment particularly in commercial buildings will support the product demand. Necessity for effective protection to reduce the HVAC leakages and enhance energy conservation has stimulated the product demand. As per Environmental Protection Agency (EPA), HVAC leakage causes up to 30% of the energy loses. Efficient thermal resistance for the operating temperatures ranging from 4 OC to 121 OC along with moisture resistance, improved performance in wet conditions will drive the fiberglass duct wrap insulation market. Inclination towards fiberglass in the overall insulation industry owing to its significant properties has enhanced the product penetration. High flexibility, easy installation, improved comfort control and enhanced condensation control are among major properties driving the fiberglass duct wrap insulation demand. Significant features including reduction in temperature interchange, enhancing moisture control and energy efficiency will stimulate the industry demand. Regulatory compliance for the energy efficient HVAC systems due to increasing energy concerns will support the fiberglass duct wrap insulation market. Government initiatives to promote effective and sustainable technology for ventilation, heating and air distribution applications will fuel the product demand. According to Department of Energy (DOE), duct systems reduce energy consumption ranging from 25% to 40% with enhanced air distribution. Fluctuating raw material prices along with sustainability trends are among key factors affecting the fiberglass duct wrap insulation price trend. Growing penetration of polymer-based products as a substitute is among major challenges for industry growth. In addition, stringent regulations on the released airborne glass wool particles caused due to lack of efficient binder may impact product scope. Fiberglass duct wrap insulation with facings dominated the industry share accounting for over 65% in 2017. Improved vapor retarding properties along with efficient protection of HVAC components have enhanced the facing materials demand. Polypropylene and aluminium foil are among the commonly used materials for facings. Extended durability, ease in handling and enhanced moisture control are among key properties driving the industry demand. Fiberglass duct wrap insulation market without facings type will witness growth around 6% up to 2024. Rising adoption of unfaced products due to its multipurpose applications in the construction industry will propel the product demand. High temperature resistance up to 232 OC (450 OF) along with enhanced condensation control provides a positive outlook for the industry growth. Moreover, reduced costs due to absence of facings provide a competitive edge for product scope. Fiberglass duct wrap insulation market from residential application is expected to generate over 350 million sq. meters by 2024. Strong outlook in residential ventilation and air conditioning coupled with growth in global residential construction will propel the industry growth. Increasing government investments in residential projects along with favourable policies on housing schemes will support the product demand. Commercial & industrial applications dominated the industry share accounting for more than 60% in 2017. Robust growth in the commercial construction industry supported by rapid urbanization has enhanced the product penetration. In addition, supportive architecture for commercial buildings including centralized air conditioning will propel the fiberglass duct wrap insulation market growth. North America fiberglass duct wrap insulation market was worth more than USD 600 million in 2017. Higher adoption of glass wool in the region due to its rapid commercialization and abundant availability will support the industry demand. Shifting preference for sustainable solutions including use of recycled glass will propel the product demand. Government initiatives to support commercial as well as residential constructions will drive the business growth. Asia Pacific fiberglass duct wrap insulation market is anticipated to witness CAGR over 6% up to 2024. Significant growth in the regional construction output due to supportive regulations and enhancing economy will drive the industry growth. Growing construction of manufacturing facilities due to favourable socio-economic conditions will propel the industry demand. Increasing preference for energy efficient HVAC systems to reduce the energy cost and enhance eco-friendly functions has further stimulated the fiberglass duct wrap insulation market demand. Global fiberglass duct wrap insulation market share is highly competitive with presence of large number of regional and small-scale companies as well as multinational corporations. 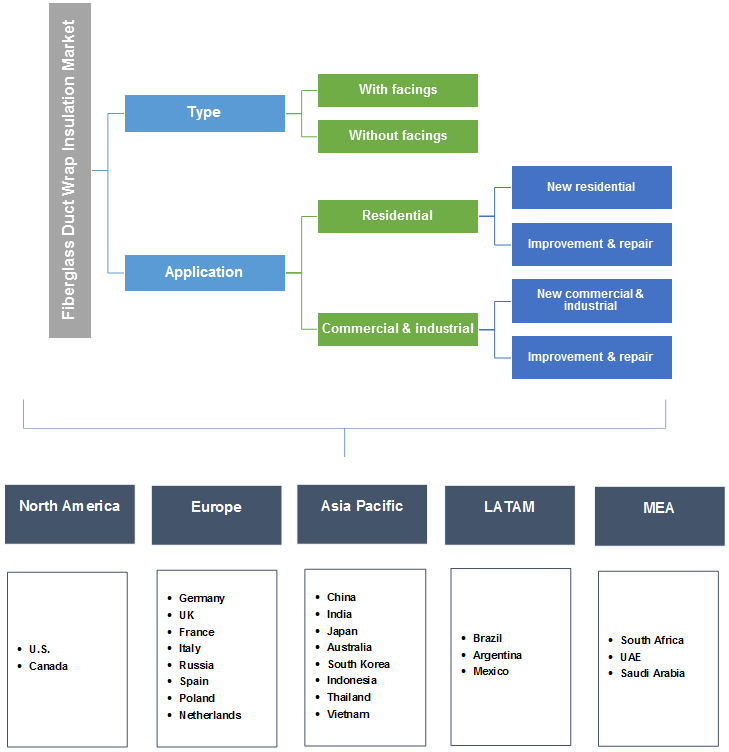 Multinational companies are commonly involved in comprehensive product portfolio, whereas regional players are mainly focused on duct wrap insulation products. Owens Corning, Knauf, CertainTeed, Mag-Isover and Johns Manville are among the major players. The companies are involved in several strategies including mergers & acquisitions, collaborations, joint ventures, supply agreements and product portfolio expansions to gain a competitive advantage. Other notable fiberglass duct wrap insulation market players include Twiga, Manson, Thermaire, Frost King, Lamtec Corporation and GAF. Manufacturers are also focused in integrating the value chain with forward integration, backward integration and full integration. For instance, Owens Corning is a fully integrated company with operations involved in raw material supplies, manufacturing and distribution. Fiberglass duct wrap insulation is a thermal resisting material mainly employed for exterior of commercial and residential ducts. In addition, these products are also used to enhance the acoustic performance of the HVAC components. These are blanket type products uniformly textured, composed of tan, fibrous glass moulded with binding agents. Facings are additionally provided to the product to enhance the external barrier properties. Product portfolio of the major companies include faced as well as unfaced products. Improved designs along with optimum and recommended R-values will further propel the product demand. Easy installation, high flexibility along with enhanced comfort control & condensation control provides a positive outlook for the fiberglass duct wrap insulation market demand.